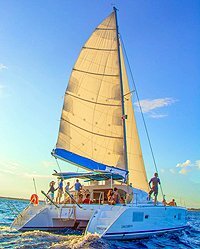 Luxury Catamaran Sailing Tour in Playa del Carmen - Save Here! Join us for a small group sailing adventure aboard this luxurious sailing catamaran! This beautiful boat has capacity for up to 40 people, so you and your crowd well have a great luxurious sailing trip on the Caribbean Sea of Playa del Carmen. We will sail along the seemingly endless white sand beaches of the Riviera Maya to one of the area's best coral reefs where we'll enjoy snorkeling with tropical fish, sea turtles and other magnificent sea creatures. We can also enjoy stand-up paddleboarding (SUP). Once you're back on board, you'll be treated to a truly light lunch and enjoy your favorite drink from the all-you-can-drink open bar. Along the way, you can lounge on the front trampoline or in the shaded areas, as we sail back across the turquoise Caribbean waters under the power of the wind. This is truly a day in paradise! Sail with the wind on a beautiful catamaran on the Caribbean Sea! Enjoy snorkeling in a shallow bay with amazing coral reefs, sea turtles and lots of tropical fish! Feast on a Light Lunch as we sail back to shore! Cruise Passengers: Yes! This tour is great for a shore excursion. When: Twice Daily at 8:30 AM & 1:00 PM. Exact pick-up time will depend on the location of your hotel but will be specified on your confirmation. Where: Complimentary Pick-up and Drop-off at your Playa del Carmen or Riviera Maya hotel. Extra Money for Tips, Fees, etc. Kids: Ages 8 and up. Kids prices apply to ages 8-11 years. Note: This tour is also available in French from Monday-Friday. Restrictions: Snorkeling not recommended for pregnant women, people with limited mobility, with respiratory, heart conditions or conditions that can cause loss of consciousness.